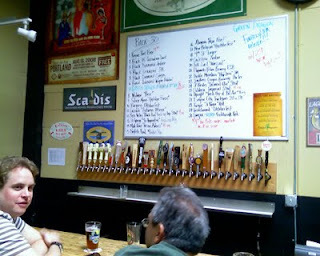 The 30 new taps that have been sticking out of the back wall of the Green Dragon since March are now stocked. That makes 50 taps, including a couple nitro taps, plus a beer engine. At lunchtime when I've been in, there's not a dedicated server at the "Back 30" -- that's what they call the back bar -- so whoever's tending bar has to hustle back and forth. I'd say 30 taps is a good trade for the dartboard that used to be back there, but it would be nice if they figured out some other place to put a dartboard or two. I say ditch the shuffleboard table that no one ever uses. Last week the first beer brewed at the Green Dragon was served: the aptly named Finally! IPA. Does that mean there's a brewer at the Dragon now, and the brewhouse is in production mode? Well, no. The beer was brewed by Oregon Brew Crew members. Man, $4.75 a pint and you're using free labor to make the beer? Nice Tom Sawyer action there -- the bartenders better hope Rogue doesn't realize how many Portland beer swillers would work a shift for free. Anyway, hats off to the stand-in brewers, they did a nice job on Finally! -- a dense, cloudy IPA with very grapefruity hops. It's already off -- don't know if they sold it all or saved some kegs for posterity's sake. In another development, the door from the bar to the back patio was finally installed a few weeks ago. That's handy: it's now legal for you to carry your own beer from the bar to the patio. 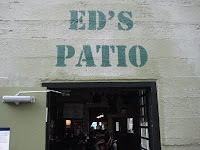 The "Ed's Patio" sign over the door doesn't make much sense -- it labels the entry back into the bar, not the opening to the patio. It's an awkward gesture to name part of the bar after the last guy to hold 2/3 of the hot potato, given the drama occasioned a year ago by Ed's sale of the place to Rogue over the objections of Lolo, a founder and 1/3 owner. I have an idea: let's start calling the front bar "Lolo's Bar", and the pinball machines "Parker's Arcade". Speaking of Parker and Lolo, their post-Dragon assistant-brewmaster gigs are going well. Jim is at Chuckanut Brewery in Bellingham, WA, which won four GABF medals -- 2 gold, 2 silver -- this year, as well as the Small Brewpub of the Year. Lolo is brewing at Silver Moon in Bend. A few months ago I saw him at Fred Fest, and he looked happier than he did even during the early days of the Green Dragon. The Green Dragon regularly puts on a keg of Silver Moon, and stocks 3 or 4 bottles from them, so he's brewing some beer for the place after all, just not the way he envisioned it. So, here we are after a year of Rogue ownership. The finished patio and increased number of taps are positives. The relatively high prices on beer and food are negatives. The atmosphere is as good as it's ever been -- Rogue has kept up an interesting schedule of meet-the-brewer nights (though tonight's "brewer" is Aengus Ciderworks) -- and the new Cascade barrelhouse and pub around the block will make the area even more of a beer destination. I don't go to the Green Dragon as often as I used to -- largely because of the high beer prices -- but it's still in the rotation. What do you think? Has Rogue changed it for the better, the worse, or not much at all? You PBPI project lists the average cost of a pint at about $4.27. If Green Dragon is so overpriced by your opinion, then what is the ave. cost a pint for Portland with GD removed from the equation?Is it significantly different? Personally, I think the net quality of the Dragon hasn't changed much. Many things are better. Many things are worse. But the fact that they're bringing the building up to code and keeping the veneer (if not the revolutionary, subversive, secret meeting stuff) the same is a Good Thing(tm). I'll continue to spend my money there as long as they keep it interesting. It's a mixed bag of changes at the Dragon. I appreciate the number of taps, a good patio, an event venue, and a place that's supportive of local brewers (both professional and amateur), and I'm willing to pay a higher price for beer and food to make up for that. On the other hand, I'm a Founder and I get my first one for free and then 10% off my tab, so that doesn't help anyone else. But when it comes down to it, we have so many choices of where to drink--and where do drink inexpensively, even--that the higher prices only become a problem if the GD is your one and only haunt. My biggest complaint about the food isn't the prices, but the selection. I think their menu is in need of a shakeup, but that's just me being picky. Personally, if I weren't a Founder I'd still be willing to drop a little extra on a pint or two knowing that what they give to the beer community is more than just a place to drink. gepr, Andrew: good points, I agree. Anon: Removing Green Dragon lowers the PBPI pint figure to $4.17. It had the highest SPE of the 9 bars I covered -- probably Henry's and the Pearl Rogue are more expensive, but they're not in my list. Hey, some of us do use the shuffleboard table! If you want darts, the Lucky Lab is just a short stumble away and the Horse Brass isn't that much further. No offense, Kevin. I just never see anyone on it. If they replace it with a dartboard, Hal's is only as far away as the Lucky Lab :-). Is there any other place in town that has an equivalent number of taps? Now that the back set of taps is open I imagine their selection must be one of the biggest in town. Horse Brass has 25 regular taps, 25 rotating, and 3 cask engines. Henry's (which I'm not a fan of) has 100 taps. Apart from that, most places are probably around 20 taps: Bailey's, Belmont Station, Pilsner Room, East Burn, Concordia. Any other 50+ places I'm forgetting? I'm surprised that nobody has written anything regarding the so-called "service" at the Green Dragon. It's the only place in town that's capable of making the average patron wish he/she were sitting barside at a McMenamin's. I agree with the last Anon. post about the bad service. I have been there twice and won't be back.I have a feeling that if I was young and good looking I might get some service. Rather let them feast on idol sacrifices than bear the reproach, or expose themselves to the ill-will, of heathen neighbours. The Dublin Pub is a 50+ tap handle house, I believe. You're pretty dead on with the service, altho I don't believe it has gotten worse, if any thing Rogue has improved it (albeit slightly) from the previous administration. And while neither young nor pretty, I am a Founder. Thanks, Patrick. Dublin Pub's website says 59 taps.